Merely mortal historians dream fondly of writing one book of enduring significance. 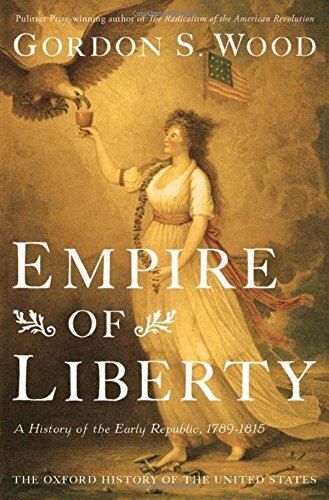 With the publication of Empire of Liberty, Gordon Wood, emeritus professor of history at Brown University, has now published three such volumes. His Creation of the American Republic, 1776-1787 was recognized immediately upon its appearance in 1969 as a nearly definitive explanation of what the republican political principles of the American Revolution meant to their proponents and how those ideas fueled the successful revolt against Britain. Then in 1992 he published The Radicalism of the American Revolution, a compelling study that showed how widely and deeply the Revolution's republican ideology worked to shape all aspects of early American society. In a career also marked by a stunning proliferation of seminal scholarly essays, insightful books on the major founding fathers, and much general writing of the absolutely highest caliber, Wood's addition to the noteworthy Oxford History of the United States could be the occasion for pure celebration. If, instead, I take more time to treat what strike me as problems, it is not from any doubt about the book's triumphal success in achieving what it set out to do. That goal seems to be a political history of the early United States that also explains the many connections between the era's political life and the dramatic changes percolating through American society as a whole. The organization of the book indicates clearly what Wood is attempting. Its introduction and first eight chapters narrate the trials of the new republic from the writing of the Constitution through the administrations of George Washington and John Adams to "the Jeffersonian Revolution" of 1800, when the Democratic Republicans displaced the Federalists as the nation's guiding political faction. The more than 300 pages in these chapters offer a bravura account of frequently retold events, enlivened with telling details (when Washington became the president, he employed more workers at Mount Vernon than he supervised as head of government), persuasive judgments on individuals (James Madison was "the most intellectually creative public figure America has ever produced"), and commanding interpretations of key documents (the Federalist Papers, various Indian treaties, Federalist and Democratic Republican propaganda, and the Virginia and Kentucky Resolutions that protested Adams' Alien and Sedition Acts). Then come two thematic chapters on social organization and the opening American frontier, c. 1800; followed by two especially compelling chapters on law, the Supreme Court, and Chief Justice John Marshall; then four thematic chapters (reform, slavery, culture, religion); followed by two outstanding chapters on American foreign policy and the War of 1812, featuring the maneuvers of Presidents Thomas Jefferson and James Madison; and finally a last chapter on the great changes in the country from 1789 to 1815. In other words, we have a political narrative with interpolations. So, what could possibly be troubling about such a work? The materials for complaint, which are mostly provided by Wood himself, concern issues of comprehension, causation, and irony. First is the question of comprehension, which is best explained comparatively. Wood's volume in the Oxford History of the United States most closely resembles volumes by Robert Middlekauff on the American Revolution (The Glorious Cause, first edition 1982) and James McPherson on the Civil War era (Battle Cry of Freedom, first edition 1988), which were also superb political histories. None of these volumes, however, accomplished what Daniel Walker Howe brought off so successfully in his 2007 contribution to the Oxford History, What Hath God Wrought: The Transformation of America, 1815-1848. While Howe too provided sterling political history, he also drew upon a vast quantity of social history and the recent outpouring of scholarship on previously understudied groups to write a full history of the American people. When Howe showed how the political history shaped broader cultural values, his work paralleled what the others had done. But when he went beyond to demonstrate how the political history often reflected economic, demographic, religious, cultural, and intellectual developments, he reached a level of comprehension not nearly as obvious in the other volumes. To be sure, Empire of Liberty has useful pages on Native Americans, commerce, agriculture, religion, the arts, voluntary organizations, newspapers and magazines, slavery, and much else, but developments in these spheres are usually treated as reactions to ideology—thus, in chapters titled "Republican Society," "The Jeffersonian West," and "Republican Reforms."